David Greening is an approved Tonnage Measurer for the Yacht Designers and Surveyors Association and can help you if you plan to register your boat on Part I of the British Registry. You can register your boat under Part I or Part III of the Registry of Shipping and Seamen. This is operated by the Maritime & Coastguard Agency (MCA) at Cardiff. Part I is the closest to evidence of title and applicants send in a Declaration of Eligibility as well as Bills of Sale showing the history of the boat’s ownership for at least 5 years. The MCA forms are all available on the MCA’s website. For those taking out marine finance over approximately £50k you will be asked to register the boat so the finance can be registered against it, in the same way as a house mortgage on the Land Registry. 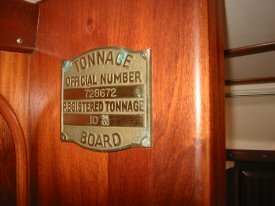 Registration under Part I requires a measurement survey of the boat, and David Greening is approved to take these measurements (also known as tonnage measurements – dating from the days when cargo capacity was all important – tons = barrels). If you would like me to assist you in completing a Tonnage Measurement for Part 1 of the British Registry, please contact me for a quotation, alternatively contact the Yacht Designers and Surveyors Association for an application form and I can complete the measurements. I work to the YDSA quoted rates, I do not charge to carry out Tonnage measurements in South Devon, but I reserve the right to charge additional costs elsewhere. If you are seeking certification under the MCA Small Commercial Vessel Code, I can carry out Tonnage Measurement for Part I British Registration at the same time as the Compliance Examination at a 10% discount from the normal Tonnage Measurement fee.